Mentioned is the way you can write English Linguist Resume Template . 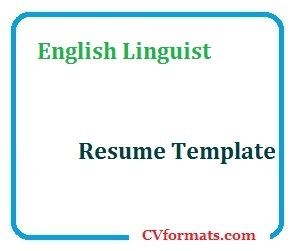 People looking for jobs can easily download these English Linguist Resume Template in word or pdf format or just view it online to copy and paste. Cover letter of English Linguist Resume Template is also available. Just change the name , address , qualification and experience and your English Linguist Resume Template is ready. Objective: Looking for a challenging position as an English linguist to use my translating, research, word processing skills for the sake of an organization. • Excellent vocabulary, grammar and command on spoken and written English. • Expertise in translation of American plank English language to common English. • Knowledge of language dictionaries and word processing skills. • Expertise in sentence creation, punctuation, synonym, acronym and content writing. • Ability to create legal documents as per the law and order. • Conducted research workshops and exam content for the students to check and enhance their English skills. • Responsible for creating various legal documents and visa terms for the immigrants. • Prepared various petitions court orders, statements, case files with discussions with legal advisor for the ministry. 1 Yr advanced diploma in English documentation for external affairs ministry. • Guest lecturer at many seminars on English documentation and translation. • Wrote many research notes and article for various newspaper and E-sites.